Social media can play a big role in bringing you more traffic and it can help you connect with your followers. Search engine optimization has gotten so incredibly complex that more and more people are discovering this is no longer a method you can rely on completely. You should definitely learn to optimize your website for the engines, but treat any traffic from them as a bonus and learn to build your traffic foundation elsewhere. Years ago, people looked at online search as a great way to get a website off the ground and social media often took a backseat to search. Now we are seeing a shift. People are realizing that traffic diversification is necessary for long-term success. Feeling Overwhelmed? Not Sure How to Begin? The number one complaint I hear about social media is that people feel incredibly overwhelmed and don't know where or how to start. I do have an account with all the major networks (Facebook, Twitter, and Google Plus) but I don't use them all equally. So I recommend signing up for the majors, to be accessible and grab your brand name, but spend time focusing on the one that makes most sense for your business. For example, you may discover that you get far better results on Pinterest than Facebook so over time you dedicate more of your time to that network than Facebook. Don't feel like you have to be popular everywhere. Even the most popular marketers find that they get the best results from one or two networks and they abandon the rest. I learned a very important lesson about only focusing on one network when I launched my natural hair site. Listen to my podcast on that subject here. Even if you don't like Twitter, a good portion of your followers may be there. So what you could do is create an account and at least use Twitter so you are accessible to your fans that use it and also share your new content there. I don't use Twitter a lot myself, but I get a LOT of questions there because many of my followers use it. So even though I'm not a huge fan of Twitter and don't spend loads of time there, I am still accessible because it's relevant to some of my audience. I also use Twitterfeed to automatically announce my new blog posts. Even if you do nothing but create an account and setup Hootsuite or another app to automatically share your new content, you at least have a presence for those in your audience who use it. So when someone reaches out to you on one of the platforms, you can reply and connect. Remember, you may hate social media but in the world we live in today, that's where a LOT of your fans ultimately are, and they will want to keep up with you on the platforms they frequent. You will probably discover that you will spend the majority of your time on one or two networks. But it never hurts to setup accounts with all the majors -- if nothing else to secure your site name. If you don't carefully and strategically set goals with social media, you could end up spending loads of time doing things that aren't productive. And unfortunately this is what a lot of people do with social media. You know the old saying, throw spaghetti on a wall to see if it sticks? Well, that's what most people do when they first join social media websites. In fact, that's what I did. When I bought Lynn Terry's video course, Social Marketing Results I realized just how poorly I managed my overall social media marketing in the early days. I didn't have any goals. I just started using the platforms and hoped for the best. I wish I had this course when I first started because I would have been more efficient and done things a lot differently. 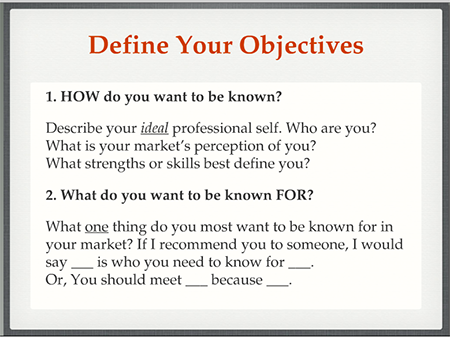 For example, in one of her videos she suggests that you start off by defining your objectives. This sounds incredibly simplistic, and you may even think exercises like this are unnecessary. But I guarantee that if you take the time to define objectives, it will keep you from wasting so much time and you'll get more value from the time you spend there. If your website is new and has little traffic, getting followers may be a challenge at first. I would highly recommend following people who have sites related to yours. Reply to their tweets, posts, etc. and engage in conversations. For example, say you have a site on cars. 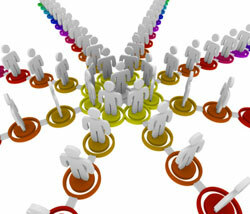 You can join popular Facebook pages related to your niche. Join in the discussion with other "fans"/members. You can also change your FB profile to display your own Facebook page name instead of your real name. Update this in your Facebook Profile Settings. That way when people click on your "name" they will go to your FB page. Just remember. You have to give to get. Social networking is not just about you blasting ads and links to your own site. The words "social" and "networking" both imply multiple parties are involved, and that is true. Take the time to comment on other people's work or posts. Write a response blog post to a controversial article someone wrote and tweet it to them. If the person also has a FB page you can "Like" the page then cross link your pages together by typing @TheNameOfTheirPage when you post it to your FB page. Here's my witty response to @NameOfFaceBookPage 's article about Car Emissions. Now the link will also be posted on their page. Note: Be responsible about the above strategy. If the article is worthless and clearly just an attempt to get a link back to your page, the person may remove it. Just remember, you don't have to be popular everywhere. Figure out which platforms (two at the most) to start with. Think about which ones are most relevant for your niche. For example, Facebook's audience is getting older. So if your site is dedicated to teens, then it may be better to focus on Instagram. Don't forget to listen to my revealing podcast on my lesson about using social media when you start a website. Is search engine optimization dying?